Gyatrul Rinpoche (b. 1925) is a senior lama of the Palyul lineage of the Nyingma school of Tibetan Buddhism. Born in the Gyalrong region of eastern Tibet in 1925, Gyatrul Rinpoche was recognized at a young age by Jamyang Khyentse Chökyi Lodrö and Tulku Natsok Rangdrol as the incarnation of Sampa Künkyap, a Payul lineage meditator who spent his life in retreat and who later gave empowerments and transmissions from his retreat cave to multitudes of disciples. 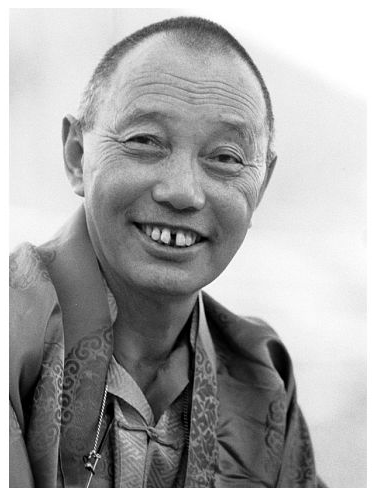 During his extensive spiritual training, Gyatrul Rinpoche received personal instruction on many Buddhist treatises by numerous renowned masters of the Nyingma tradition, including Tulku Natsok Rangdrol, Payul Chogtrul Rinpoche, Apkong Khenpo, Dzongter Kunzang Nyima, and His Holiness Dudjom Rinpoche. In Tibet he received the oral transmission and instructions on the Shyitro Gongpa Rangdrol from the eminent Lama Norbu Tenzin. After fleeing from Tibet into exile in India in 1959, Gyatrul Rinpoche continued his spiritual training and served the Tibetan community in India in various ways until 1972, when His Holiness the Dalai Lama sent him to Canada to offer spiritual guidance to Tibetans who had settled there. Since then, he has taught widely throughout North America, establishing numerous Buddhist centers, which include Tashi Choling in Oregon, Orgyen Dorje Den in the San Francisco Bay area, Norbu Ling in Austin, Texas, Namdroling in Bozeman, Montana, and a center in Ensenada, Mexico. He presently moves back and forth between his principle center, Tashi Choling, and his home in Half Moon Bay, California. Venerable Gyatrul Rinpoche, Generating the Deity, translated by Sangye Khandro (Ithaca: Snow Lion, 1996). The second revised edition was published under the title The Generation Stage in Buddhist Tantra (Ithaca: Snow Lion, 2005). Karma Chagme, A Spacious Path to Freedom: Practical Instructions on the Union of Mahamudra and Atiyoga, with commentary by Gyatrul Rinpoche, translated by B. Allan Wallace (Ithaca: Snow Lion, 1997, 2010 for the second edition). This book was also published under the title Naked Awareness: Practical Instructions on the Union of Mahamudra and Dzogchen (Ithaca: Snow Lion, 2000). Venerable Gyatrul Rinpoche, Ancient Wisdom: Nyingma Teachings of Dream Yoga, Meditation & Transformation (Ithaca: Snow Lion, 1993), translated by B. Allan Wallace and Sangye Khandro. The second edition was published under the title Meditation, Transformation, and Dream Yoga (Ithaca: Snow Lion, 2002). ↑ Bio information adapted from Allan Wallace's introduction to Natural Liberation and other online official resources. This page was last edited on 7 February 2016, at 10:39.